Bootle Glass has begun work on the renovation of King’s Gardens at Southport to restore the facilities to their former glory, conserving the historical features and landscaping for future generations. 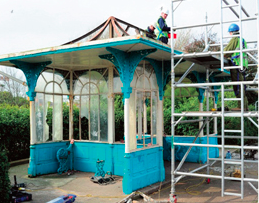 The restoration funded by The Heritage Lottery Scheme includes the Victorian Shelters, the Venetian Bridge, the Lakeside Café, former ladies toilets and original park infrastructure. A focus on conservation and tradition will be heavily reflected in the glazing works which will incorporate the latest technologies to preserve the original features. Bootle Glass has a great depth of experience installing speciality glass and is well versed in delivering highly specialised developments for various project partners to bring that expertise and knowledge to specialised project. Work on the development is expected to be completed this month.